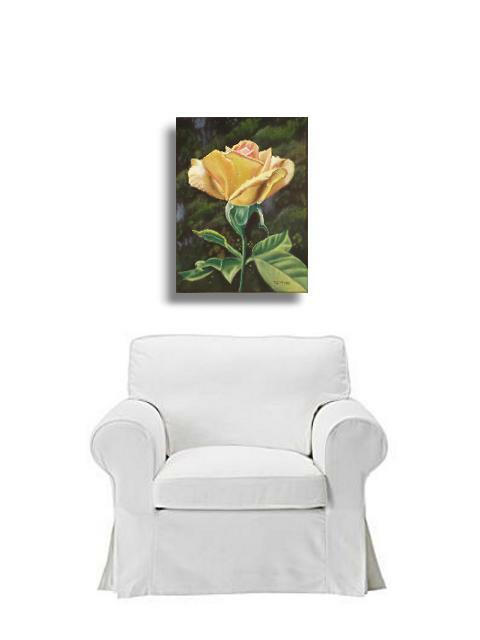 Single Yellow Rose oil painting by Artist Delmus Phelps. Lets talk some on what the yellow rose symbolizes and why it might be just the right choice for you or that someone special. This rose usually means there is happiness and love in the air. It means you are happy in your relationship. Its also known as the rose of friendship. In some parts of the world (in Eastern cultures) it means joy, wisdom and power. But take care, the yellow single rose has a double meaning! In days of old, it was used to express jealousy and infidelity. Always send the yellow rose with a note explaining which of the two meanings you mean. Or you may be opening a whole can of worms that you got some explaining to do! 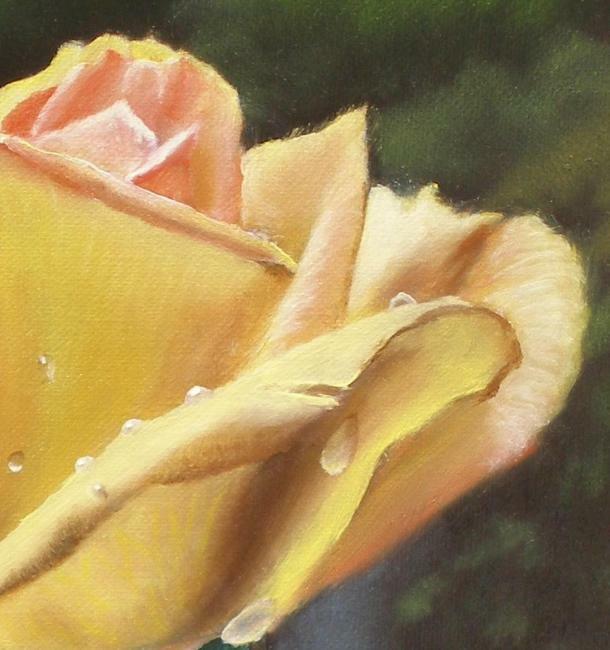 The first yellow roses were found in the Middle East around the 18th Century, and were not very fragrant. Actually, they had no smell, just looked pretty. Hybridizing and cultivation has changed all that today to give us many aromatic varieties and color varieties. Its a great rose to send to a special friend to brighten their day. To find out more about the meaning behind a certain color of the rose, click here to see what each rose color means. 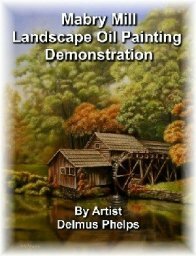 This is an original oil painting of a backyard beauty! It is not a print, or reproduction or air brushed. It is the real deal, all hand made using artist brushes, oil paint, and canvas board. The size is 9" X 12" (on canvas/board). 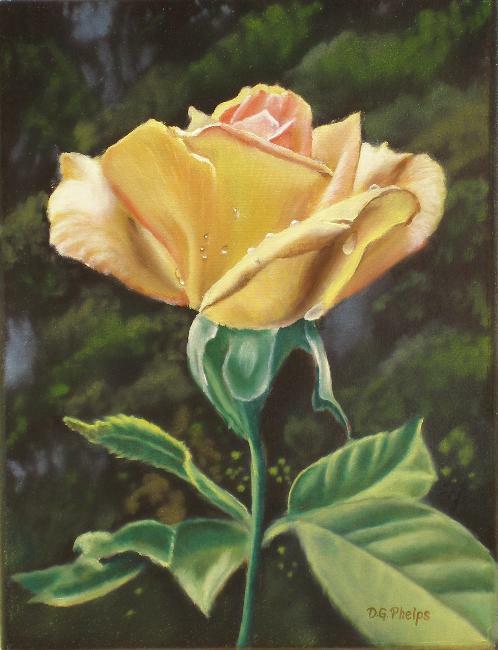 This painting includes a gold 2-1/4" wide frame making the overall dimensions 14" X 17". You can get pricing and availability information here at my Etsy Store. This painting has sold, but do click the link, you may find another! Better yet, why not sign up for my "New Art Newsletter"! This is on my personal artist website and it will notify of when a new painting comes out. 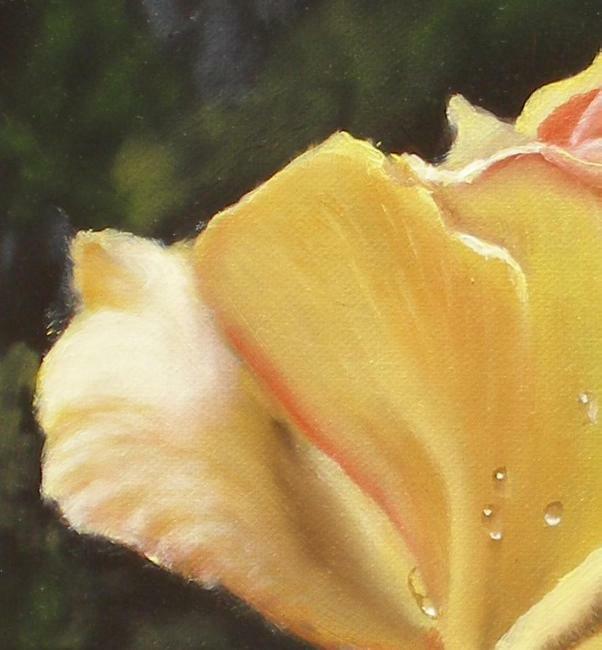 Close up photo's of the single yellow rose painting. Would you like more information about how I created this artwork. Just click the link, I also tell you about my guarantee when buying art online.